I had every intention of writing something for today, but due to all of the packing/secret Santaing I had to do last night, I just didn't have time. Tonight, I fly back to the state that looks like a mitten and will be there until December 28th. I still intend on watching and breaking down the ACC championship game between Virginia Tech and Clemson, and I'm bringing my hard drive with me to do so, though I'm not sure when that content will start going up. All previous content on the game can be found on the bowl games page. As mentioned around these parts, Virginia Tech QB Logan Thomas isn't much of a runner despite having decent rushing numbers on the year. He's a big, bulky QB who defenses have to account for but not really respect in the running game. He's not going to beat you with his legs. The basic read play that the Hokies use is the inverted veer that Michigan used against Ohio State and Auburn used to win a national championship. However, they will occasionally throw in other option plays. 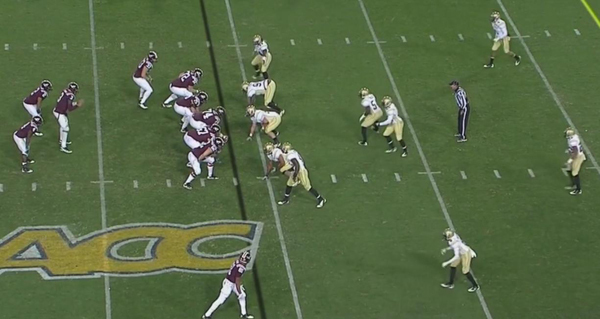 Against Georgia Tech, they showed a triple option look from a two-back shotgun set. The Hokies comes out in a two-back, two-wide set with an H-back to the playside of the field. Georgia Tech is in their base 3-4 defensive front. 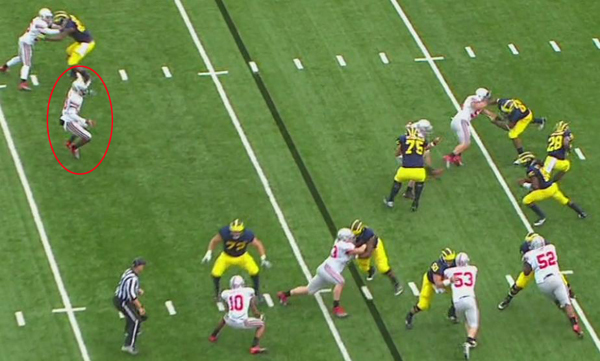 As the ball is snapped, the fullback to Thomas' left comes in motion for the dive option. Meanwhile, running back David Wilson swings behind Thomas to be the pitch man if the QB pulls the ball. I think (?) Thomas is reading the playside linebacker who will be left unblocked by the H-back. As Thomas pulls the ball, he and Wilson are now on the edge against one defender, the playside linebacker. The linebacker makes a poor decision and comes up to tackle Thomas. 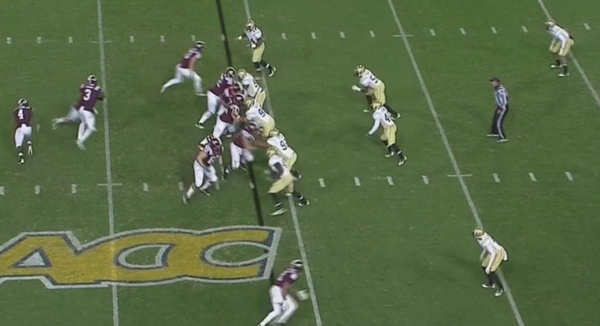 Wilson now has a clear lane to the GT safeties. Against Miami (FL), Virginia Tech didn't do all that much offensively of note. They ran the counter draw that Michigan showed early in the year, and they used the inverted veer to devastating effect against a Miami defense that just couldn't figure it out. Otherwise, it was a lot of downhill running, clean pockets, and checkdown passes. They did run a really interesting bubble/tunnel screen late in the game. (First, apologies for the quality of the screenshots. This was not a high-res rip of the game.) This is right as the ball is snapped; the camera work on this game was mediocre. 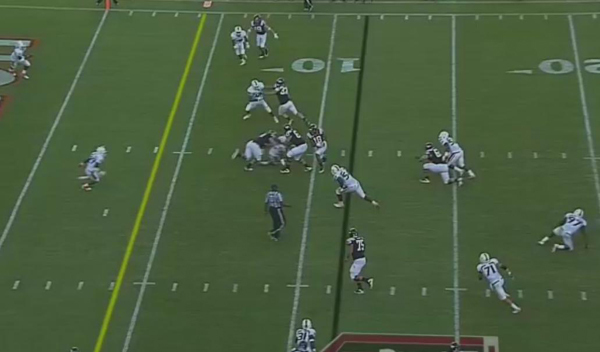 The Hokies are in a three-wide set with a tight end lined up as an H-back and a running back to Logan Thomas' left. Miami is in a 4-3 nickel formation. 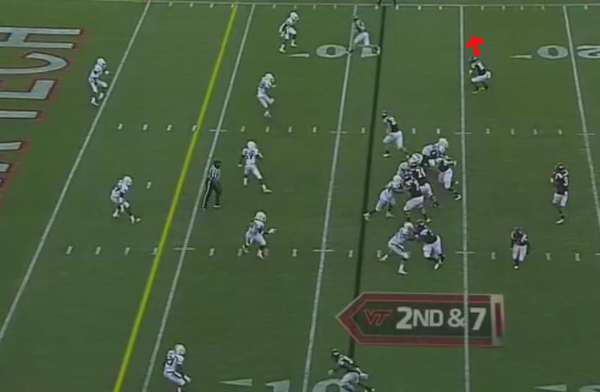 As the ball is snapped, Thomas looks off to his left as the VT running back heads for the flat. The slot receiver to Thomas' right starts to bow out for a bubble screen. 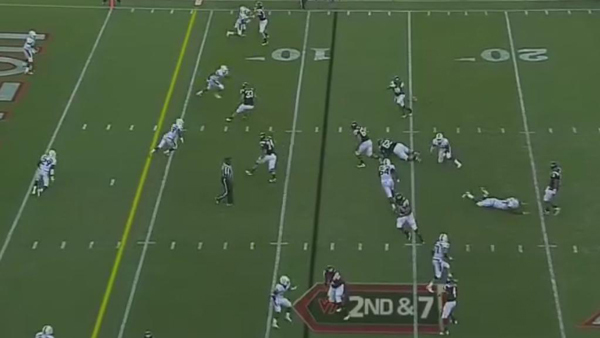 The H-back heads immediately upfield to block the nickelback lined up over the slot receiver. Miami, for what it's worth, is in a basic cover-2 defense with five zone defenders underneath. A moment later, after the nickelback has taken a few steps toward the sideline to cover the bubble screen, the slot receiver reverses his direction and begins running toward the middle of the field for a tunnel screen, the likes of which Michigan has run with Jeremy Gallon all year. The VT offensive line has now successfully slipped the rushing defensive linemen and are headed to the second level to block Miami's linebackers. The slot receiver is catching the ball and turning upfield. ...and is brought down for a six-yard gain. Obviously, the goal of this play is to get the second-level defenders running toward the sideline so that they can clear out the middle of the field for the tunnel screen. The Hokie linemen are supposed to seal the linebackers to the outside, putting the receiver one-on-one with the safety. 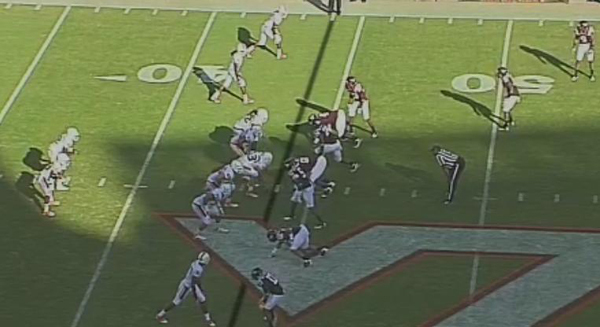 Unfortunately for Virginia Tech, Miami has the perfect playcall to defend this play. 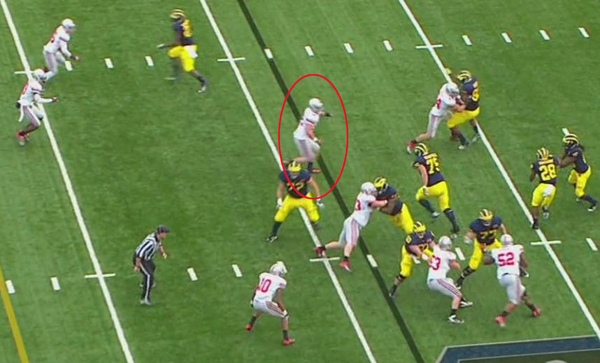 This is a man-coverage beater, though, something that worries me against Michigan's defense. If you're not disciplined or read the play quickly enough, whoever is covering the slot--either Avery or Jake Ryan, who frequently played that role against Illinois--could easily overrun the play. As I mentioned in the Miami Impressions post, Virginia Tech's linebackers are not very good. This also explains why only one of them shows up in the team's top five tacklers, supplanted instead by four members of the team's secondary. Miami took note of the linebackers' susceptibility and aggressiveness throughout the game. This is just one example. Miami comes out in a heavy I-form set with a tight end and H-back. Virginia Tech shows the 4-4 run stopping front that they used throughout the game. This will be a counter iso run, a designed cutback to attack the Hokie linebackers. As the ball is snapped, Jacory Harris turns to his right. The Virginia Tech linebackers immediately react and start moving to their left. Notice, however, that the Miami offensive line is creating a hole in the B-gap on the left side of the line (top of the screen). 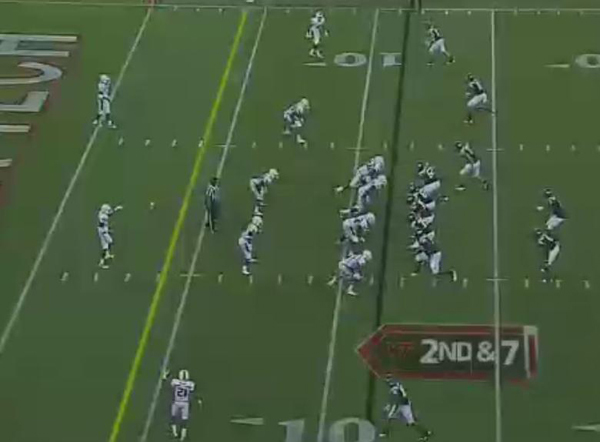 As Harris hands the ball off, you can see the huge hole opened by the Miami offensive line. However, all three of the Hokies linebackers have run past the gap. 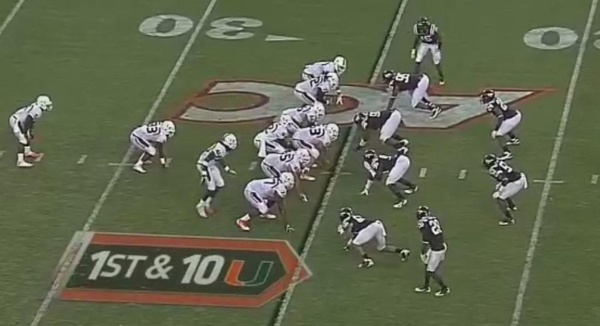 The Miami center is releasing upfield to block the only linebacker capable of making the tackle. 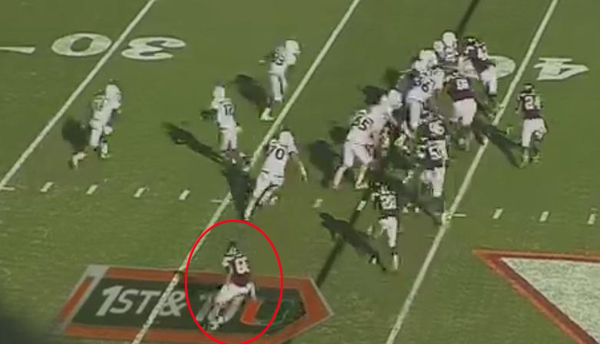 A moment later and the Miami center has reached the VT linebacker. 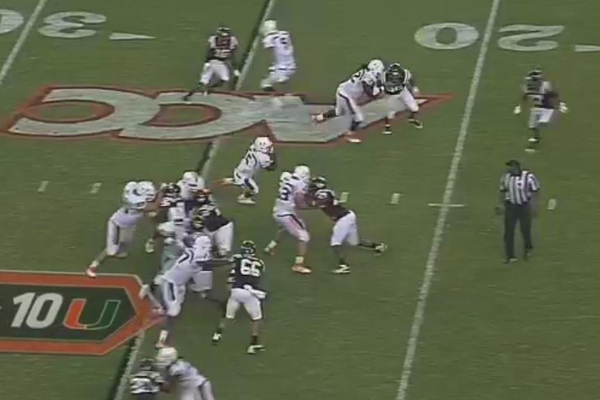 You can see the Miami running back Mike James sees the hole and is headed for it. This was not a great read/cutback by the running back. This was designed. James is now running through the enormous gap created by the overpursuit of the VT linebackers with only a safety between him and the endzone. He's partially obscured behind the referee here, but that safety makes the tackle. The play results in a six-yard gain. Though Virginia Tech's linebackers have almost surely improved from the middle of the season when these teams played, this was a consistent trend in this game. And if the team's tackling leaders are to be believed, this probably happens more often than not. These linebackers are aggressive heading downhill and frequently bite on play action/counters like this. They don't appear to key on pulling linemen very quickly, and as is the case here, they're suspect in run fills. It'll be interesting to see what Michigan can do with this. Plays like the counter draw (which VT actually used in this game) and counter draw play action might be really effective against linebackers prone to overpursuing. Regardless, this was indicative of the team's play all game: overly aggressive reaction to the run opening lanes for both running backs and Jacory Harris. If the Hokies aren't more disciplined than this against Michigan, Denard and Co. should have no problem putting up gaudy numbers. The following are various impressions gleaned from the Hokies 38-35 win over Miami (FL) this season. I cherry picked this game because of Jacory Harris' skill set and its similarity to Denard's. As such, this post is heavy on defensive scouting. More thorough breakdowns of blitzes and defensive schemes will come later this week. From the Okie package, the Hokies rarely dropped linemen into coverage, but it was still used as a means to confuse Jacory Harris and the Miami offensive line. Blitzing. Virginia Tech brought pressure from everywhere, but most of the time, it came from the linebackers. They came both on direct and delayed blitzes and from a number of different formations. The blitzes were usually long developing and Harris had a lot of room/time to dance in the pocket. However, he rarely passed out of it and the blitzers usually found him eventually. Linebackers. Speaking of linebackers, Virginia Tech's appear to be awful. There's a reason that four of the top five tacklers on the team are in the secondary. The Hokie linebackers are bad at run fills, over pursue the run, and are really susceptible to play action. They secondary plays a lot of man coverage, so this doesn't always open up gaping holes in the middle of the field, but cutbacks and fakes almost always caught the linebackers off guard. Defensive ends. As expected, those the gaudy sack numbers from the defensive ends are due to an aggressive pass rush. On passing downs, the defensive ends run directly uphill, openly a lot of running lanes for quarterbacks. Harris wasn't able to take advantage of it, but I have no doubt that Denard/Al Borges will. This ended up being a handoff, but the VT defense was prepared for the rollout. If they're gameplanning like this for Jacory Harris, they will be gameplanning like this for Denard. Defensive tackles. Soft. They were put on skates most of the game. 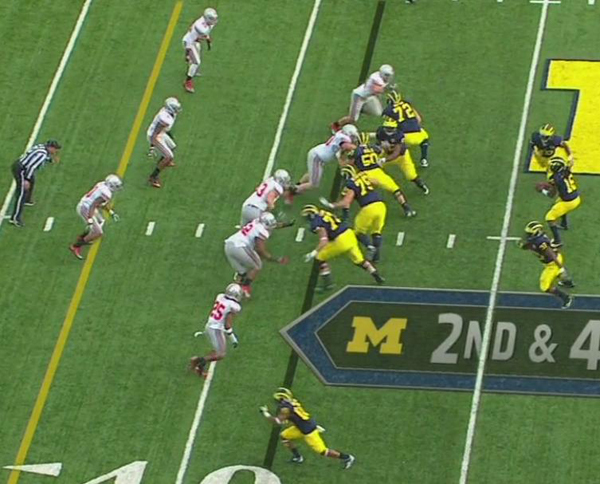 Michigan's offensive line should manhandle these guys. Safeties. These guys are aggressive. On handoffs, they come directly downhill to make tackles. There's no hesitation in their game. They may be susceptible to play action. More importantly, they were really susceptible to trick plays, the likes of which Miami ran against them a few times. Given Vincent Smith's, urm, throwing abilities, that might be something Borges brings back for this game. Formation. 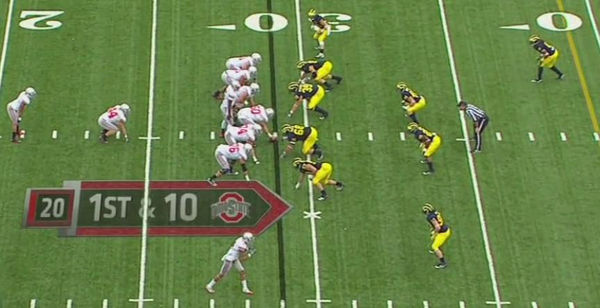 I was wrong yesterday when I said that the teams plays primarily under center. Most of the game, the Hokies were in the shotgun with three and four receivers. They rarely used fullbacks, both in the shotgun and under center. There were occasional H-backs, but for the most part, this was a shotgun, one-back set with three or four wide receivers and/or a tight end. Power running. 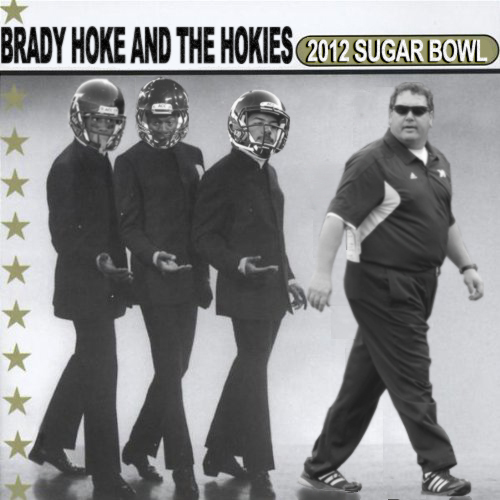 The Hokies use a lot of power running schemes, which means pulling linemen. 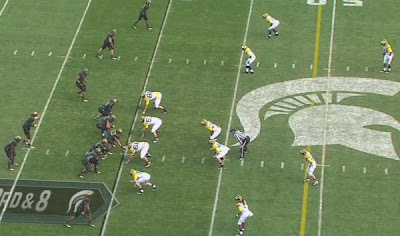 They frequently used the pin and pull (usually from under center) that Michigan deployed with little success this year. They were a little more successful than Michigan was, but not that much more. 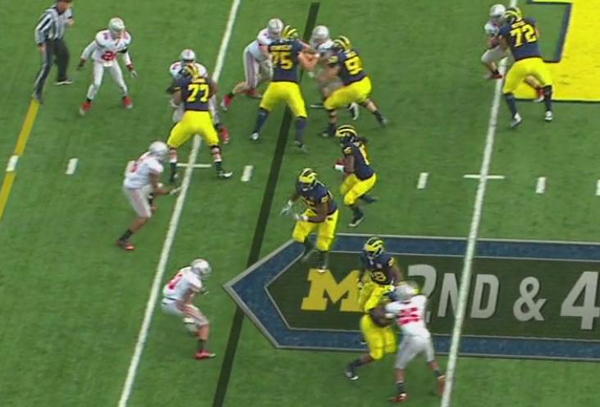 The offensive line wasn't great at zone or power blocking, and weren't able to create a ton of lanes to run through. Option running. 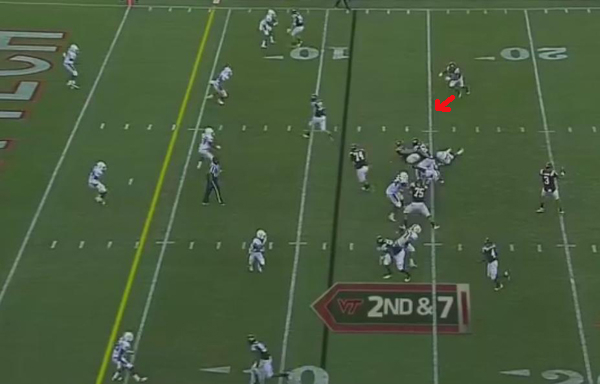 However, the Hokies used the inverted veer a lot in this game. Lumbering QB Logan Thomas was able to gain a whole ton of yards on the inverted veer. It was, however, the only real option play they ran all game. They used it frequently in the red zone and a few times elsewhere, but rarely if ever did they use any other zone read play. The only other option running play that I can remember distinctly is a speed option that was usually at least moderately successful. I hold my position: Thomas is not much of a running threat. He was used a few different times on fourth and short on quarterback sneaks. Mike Martin and Co. are begging for this. Ball security. This probably isn't a trend, but Thomas had a lot of trouble with ball security. He bobbled and fumbled one snap and failed to tuck the ball when he was pressured on another play and fumbled it. There was also another poor snap during the game that had to be recovered. I don't know if these are consistent problems, but they certainly were during this game. Checkdowns. Thomas is a smart passer. 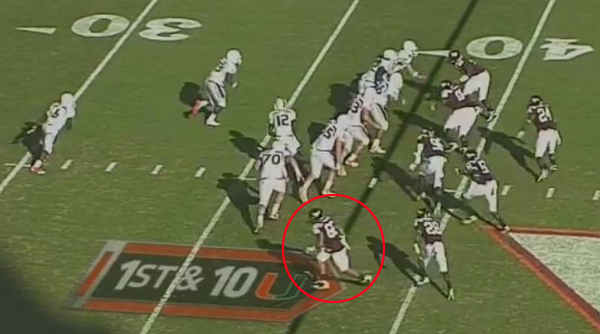 When Miami goes into a prevent shell, he frequently found his running back coming out of the backfield. Virginia Tech looked to use their running backs frequently to chip block blitzers/rushers and then head out to the flats for checkdown passes. If Michigan doesn't assign someone to the VT running backs, this could get ugly. I'm worried about Kenny Demens and Desmond Morgan in coverage. A quick reminder on coverage: Sugar Bowl coverage will be a lot like last year's Gator Bowl. After a general breakdown of the VT team, I'll cherry pick plays and games to figure them out schematically. Eventually, I'll make a prediction that will be wrong. The Hokies rank 31st in rushing yards per game, averaging 188.69 yards. The rushing offense is led by junior David Wilson. Wilson is listed at 5'10", 205 pounds. Though he doesn't have a ton of breakaway speed, he's difficult to bring down, averaging 6.1 YPC and 125 yards per game. The Hokies run a primarily pro-style offense. They take a lot of snaps from the shotgun, but they they don't run from it that frequently. When they do run from the shotgun, options looks are unlikely but they do happen. Sophomore starting QB Logan Thomas is listed at 6'6", 254 lbs and is used more as a decoy to keep defenses honest than an actual threat in the running game. Think of Steven Threet in Rodriguez's system. Sacks removed, Thomas has carried the ball 122 times for 569 yards (4.66 YPC) this season, which is a lot better than expected when you see him actually run. He lumbers down the field and doesn't have a lot of shake to him. His biggest asset is his size, which will allow him to get a few yards every time he carries, just by a function of falling forward. Senior Josh Oglesby also gets carries. Oglesby has 90 carries this season and averages only 3.7 YPC. His long run on the season is 44 yards against Marshall. beyond that, he has a 31 yarder against Duke. Oglesby is a short-yardage back (5'11", 218 lbs) who won't get many carries in the bowl game. When he does, he's not a threat to do much but pick up short first downs. However, the Hokies are a relatively run heavy team. On the season, they've run the ball 59% of the time. With a run/pass split like that and a 10-2 record, you'd expect the team to be more successful running the ball. However, Virginia Tech has won largely on the strength of their defense, about which more in a bit. The Hokie passing game isn't exceptional either. The Hokies have the 66th ranked passing offense, averaging 227.08 yards per game. Thomas is more of a prototypical passer, however: a lot of drop backs, good touch, strong arm. With a clean pocket, Thomas can do some damage against defenses, but if you get pressure (Hi Mr. Mattison), he's a little more erratic. Even still, Thomas is completing 59% of his passes this season and has a 19/9 TD/INT ratio. He's also averaging 7.71 YPA. Thomas is good-not-great. His top two targets are senior wide receivers Jarrett Boykin and Danny Coale who have 57 and 52 receptions, respectively. Boykin averages 12.8 yards per catch and has 5 touchdowns, while Coale averages 15.1 yards per catch and has 3 touchdowns this season. Both receivers are of the 6'1"-6'2" mold. Neither is Michael Floyd nor overly dangerous deep threats. Since Thomas isn't the kind of run threat that Braxton Miller is, expect Michigan's secondary to return to form against the Hokies and throw a combination of zone and man against these receivers. Thankfully no one here is DeVier Posey. 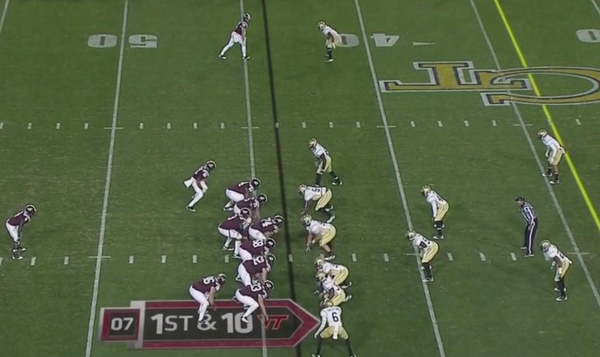 The Hokies will run out 4-wide sets frequently. When not throwing the ball to Coale or Boykin, Thomas looks for junior Marcus Davis (29 receptions, 499 yards, 5 TDs), junior D.J. Coles (34 receptions, 449 yards, 3 TDs), and senior tight end Chris Grager (14 catches, 186 yards, 2 TDs, in only 8 games). The Hokie offense shouldn't be too challenging for Michigan's defense. With a mediocre passing game and a good but unimpressive run game, the defense should be able to get Virginia Tech in long down and distance scenarios when Mattison can bring pressure. They also have a decent kicking game, converting 14/20 field goals. In total, the Hokies come in as the 38th total offense and 55th scoring offense rankings. If Ohio State was the defense getting caught off guard, anything short of that should see the defense turn in its usual performance from this season. The Hokies defense is another story. Virginia Tech has the 17th ranked rushing defense allowing only 107.77 yards per game. Not many teams have moved the ball on them that well. Georgia Tech put up 243 yards on the Hokies in 49 carries, but that's to be expected from the Yellow Jackets offense. The only team to beat VT, Clemson (twice), had mediocre days against the Hokie defense: the first times the teams met, Clemson rushed for 119 yards on 35 carries, but in the ACC title game, the Tigers rushed for 217 yards on 45 carries. Miami (FL) had the best game against the Hokies rushing defense by chalking up 236 yards on 28 carries (6.2 YPC). For what it's worth, this is one of the games I've earmarked to rewatch given that Jacory Harris probably has the closest skillset to Denard's of any of Virginia Tech's opponents. The Hokies rank 13th in pass efficiency defense but 41st in total pass defense. Where the Hokies succeed against the pass is in getting pressure. Eight different Virginia Tech defenders have more than one sack, led by sophomore defensive ends James Gayle (7 sacks) and J.R. Collins (6 sacks). Cornerback Kyle Fuller has 4.5 sacks, linebacker Bruce Taylor has 5 sacks, nose tackle Derrick Hopkins has 3 sacks, and the aforementioned Tariq Edwards has 2.5 sacks. The Hokies are tied for 11th in sacks nationally and it's clear why. They bring pressure from all over the field. The team also has 15 interceptions, most of which I would guess are pressure dependent. All of the Hokies top-five tacklers each have at least one interception, led by junior cornerback Jayron Hosley with three. This pass defense's statistical profile (good pass efficiency defense, lots of yards allowed) holds with all of this: this is an aggressive blitzing defense that thrives on sacks, pressure, and turnovers to succeed. Screens, quick passes, and counters are probably going to hurt this defense. The Hokie defense's greatest attribute is its ability to generate turnovers. As mentioned above, the defense has recorded 15 interceptions, but they also have 5 fumble recoveries, putting them 29th in turnover margin this season. This is a young defense, populated mostly by sophomores (there's only one senior starter to six sophomores; the rest are juniors). With Denard's newfound ability to scramble, it will be interesting to see how aggressive this team can be against Michigan. Their top two sack leaders are both defensive ends who, if they play undisciplined gap defense, could open huge lanes for Denard to run through. The secondary, meanwhile, appears to blitz frequently and force quarterbacks to throw off balance a lot. This has all the makings of a Good Denard vs. Evil Denard kind of game. If he can avoid the mistakes that the Hokie defense has thrived on all season, he should be able to get receivers matched up against safeties and linebackers. This is a big if, though, given the Hokies success with this brand of football all season. Michigan actually would throw one of their play action, throwback screens on this play, but the play action seems like a waste of time. 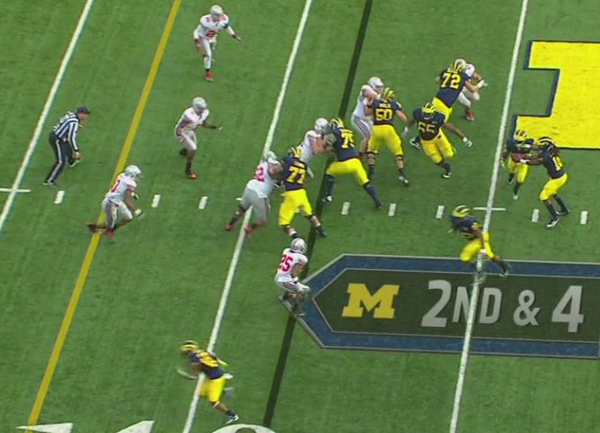 Count the defenders: you can see all 11 of Ohio State's and yet only two of them are even in the vicinity of Michigan's three stacked receivers. 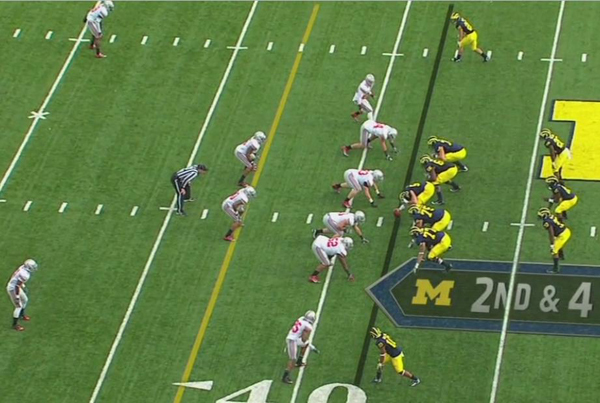 If a defense aligns like this, Denard should take one step from under center and throw it to the back receiver. Instead, the team fakes the play action and Gallon takes a step toward the line of scrimmage before fading back to catch the pass. I don't know, man. Borges has done basically everything right this year save ignoring screen passes. There's almost no way that he will implement these passes in the bowl game or next year, but that doesn't mean I won't be infuriated when Michigan doesn't throw it. Consider this my final comment on this though. 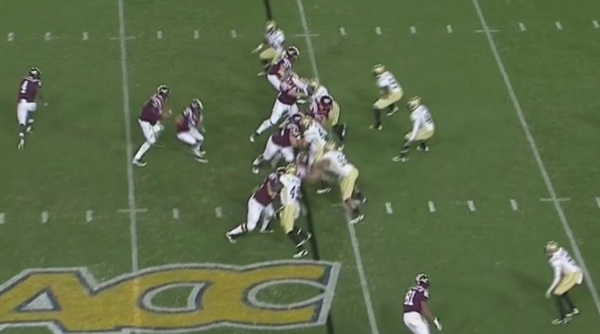 Look at how much closer to the ball Mike Martin is than all of the other defensive linemen. I'm at the point where I just don't understand this. It's too egregious and frequent to just be a mistake, but I don't understand the rationale for lining up this far from the line of scrimmage. It looks like it might give the linemen a better angle to slant into the play, but it doesn't seem like that's what's actually happening here. If anyone has any idea why the defensive linemen who line up this far from the LOS, other than They Weren't Supposed To, let me know. Yesterday, I broke down Denard's long touchdown run against Ohio State but had trouble identifying who he was reading on the play. It was either the weakside linebacker or the middle linebacker, the latter of which seemed unlikely, and the former was blocked by pulling guard Patrick Omameh. Brian from MGoBlog clarified in the comments that Denard was reading the weakside linebacker who was mistakenly blocked. Michigan used the same zone read play a number of times throughout the game, but interestingly, the pulling lineman (in the play below Michael Schofield) appeared to have the same problem identifying who he was supposed to block. 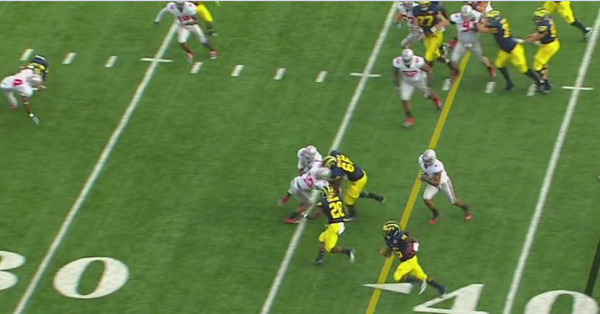 This time, Denard could not Denard the unblocked defender and Michigan lost what could have been another huge gain. 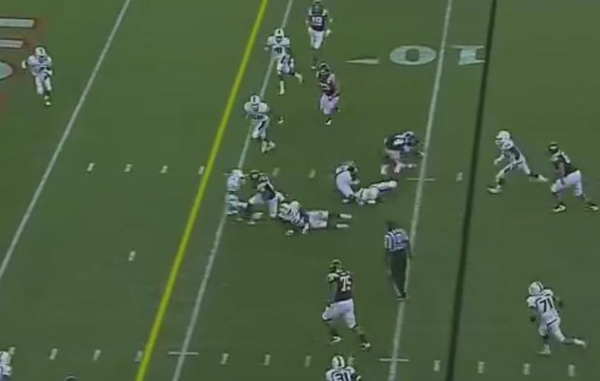 Michigan comes out in a three-wide set with twins to Denard's right, and Kevin Koger lined up as an H-back. Fitz Toussaint is in the backfield with Denard. 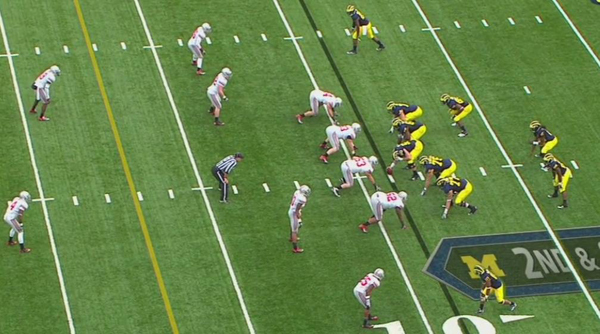 Ohio State is in a 4-3 nickel look. As the ball is snapped, right tackle Mark Huyge leaves the strongside defensive end unblocked and releases to the second level. Koger is responsible for blocking the strongisde end. Schofield begins to pull across the formation. The rest of the defensive line down blocks. 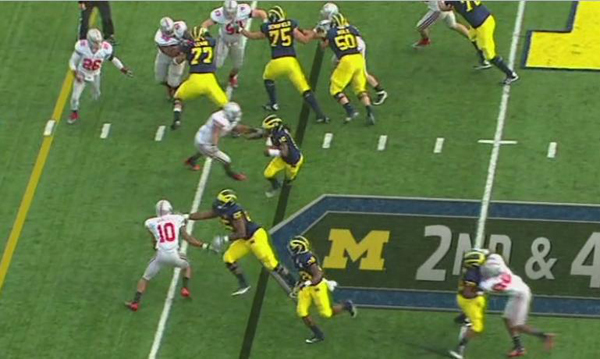 ...but he doesn't, instead blocking the linebacker that Denard was optioning off of. 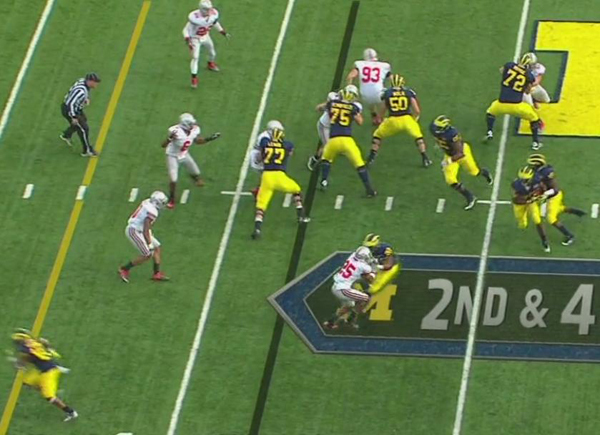 The Buckeye safety (circled in red) who Schofield was supposed to block is now standing between Denard and Awesome. 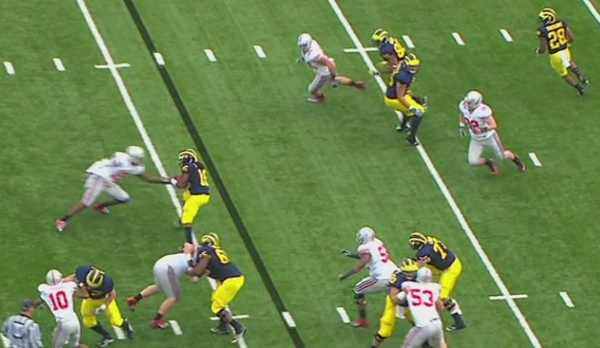 Denard sees this and tries to cut outside. Ten-man football etc etc. 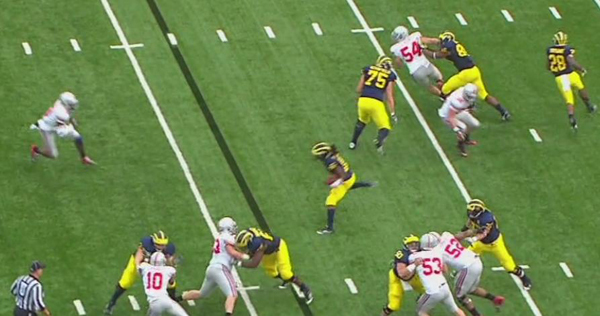 If Schofield blocks the proper defender here, Denard is running 91 yards for a touchdown. Instead, he's tackled for a two-yard gain. 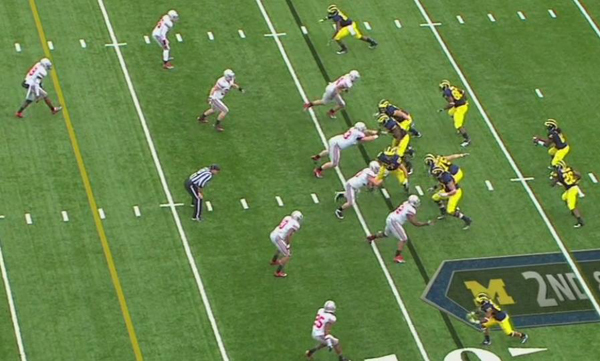 For me, this isn't quite as frustrating as when Michigan fails to run from under center. This seems like a repetition issue. Neither Omameh or Schofield have practiced this blocking scheme as much as they probably should, and pulling across the formation and finding the right defender to block is probably one of those things that just takes getting used to. That said ARGHHH. Block the right guy. I wonder what goes through Denard's mind during a play like this. "Yes, yes, got'em. Remember, take a knee. Troll Tebow. Chest bump. Hoke Point." Tackled. If Al Borges starts integrating this play into the offense next year and the offensive line gets their blocking assignments in order, this will be a fierce rushing attack, possibly on par with the 2010 Rodriguez-led team. This kind of play is both encouraging and discouraging. I'll take it. UPDATE. MGoBlog has video of this play that clarifies a question in the comments about whether or not Denard made the right read (he did). And so it is: Michigan will face Virginia Tech in the Sugar Bowl on January 3. As the game approaches, content will be similar to that of last year's Gator Bowl. Now I'll begin the arduous process of downloading and rewatching a bunch of worthless Virginia Tech games from this season. 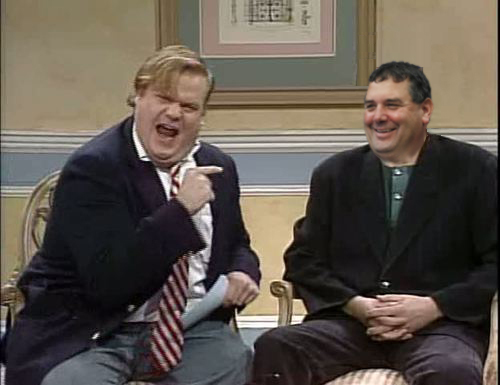 I also haven't forgotten about the Ohio State post-game. Throughout this week, I'll do the usual play breakdown and analysis. Virginia Tech extensive preview will begin next week. All coverage of the game can be found at the Bowl Games page.